It's been another great, sunny weekend. Spent lots of time with good friends, the love of my life and of course, my camera. This afternoon I stripped, cleaned and re-setup my aeroponic greenhouse. It should have been done earlier in the season but ... well .. I've been busy. Someone pointed out to me yesterday that there was a wasp nested being constructed on the underside of the plexiglass panels for my balcony. 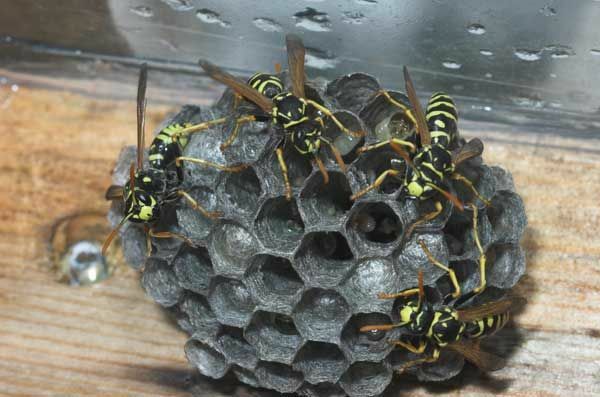 Today I obtained some great foam wasp killing stuff. Before destroying them and their fledgling home I annoyed the crap out of them by taking their picture though. It's halfway through June and this is my first 'thought' post. I really have been that busy. It's not going to be an incredibly long one, just needed to fill the space mostly. I got another lens for my D70 recently. It's a 105mm Micro-Nikkor - for doing close-up work. 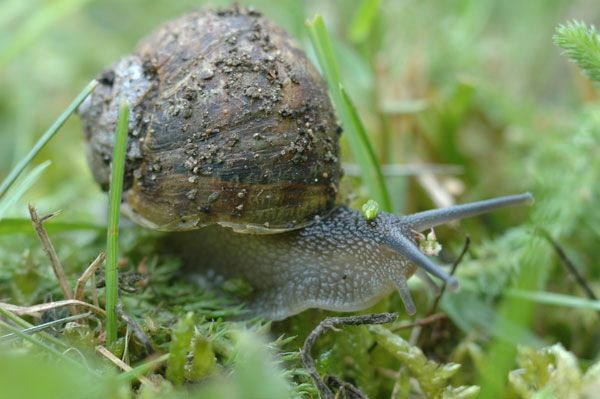 Here's a shot of a snail I took last weekend with the new lens. It has a very shallow depth of field, but yields crisp results if you set it up right.